I have a confession to make. I HATE writing about singleness! Than, why, might you ask, would I commit to writing for 31 Days about singleness? While I would love to answer you with a simple “because I’m crazy”, the real reason I’m joining the Nester’s blogging challenge to write for 31 Days through October, is because I’m choosing to live fully alive in the now. Singleness happens to describe a portion of my ‘now’. I also realized recently that I would regret not writing about singleness when I was smack dab in the middle of it. We all make mistakes, but regrets are optional. 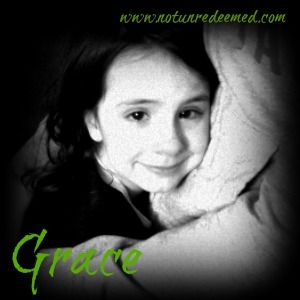 By His grace, singleness will not be one of my regrets. Posts in this series: (Please scroll down to continue to read more about the reason I’m writing these). Last week as I took a rambling walk around my childhood home, I contemplated the unexpected turns my life has taken and one of them was still being single into my late 20’s. Growing up I assumed I would marry young, maybe even married shortly after high school like a lot of my friends. In the conservative circles, it’s what you were raised to do – get married and have a godly family. Although my life is not what I expected it to be, it’s pretty wonderful. I’m also a stinker for asking myself tough questions. “Katie, although singleness is not as bad as you imagined it to be, are you living it in a way that you will have no regrets for how you spent your single years?” And it was in that moment ladies and gentleman that this series was born. My one regret would be not writing about singleness when I was in the middle of it. 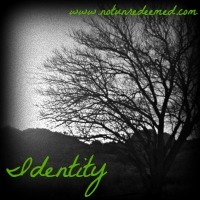 I’m in the middle of it – the joy, the tears, the longing, the contentment. The peaks and valleys are the sound waves that produce the beautiful rhythms and music of life. We may not get to pick the notes, but we do get to choose how the tune is played. Through my teenage years and early twenties, I didn’t see very good examples of what singleness could be. What I saw made me pray that the Lord would never let me become what I then deemed as an ‘old maid’. I hate writing about singleness because although it describes the season I’m in, it does not define me. In my perception it defined the singles I knew. Singleness is a tough topic to write about as it’s easier to address one extreme of the other – either the longing and the loneliness or to paint it as ‘all joy’. The reality is, singleness (as is the rest of life) contains both. My hope with this series is to show a more complete picture and example of what life lived being single and fully alive can look like. 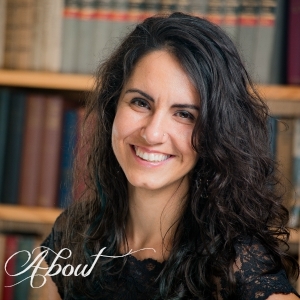 While some days there might be didactic teaching (this is me after all ☺), and thoughts on singleness, more often than not each day will be an open journal of a normal day in my life. Tears and laughter, travel and ministry come what may; I want authenticity to be the flavor of the day. So friends will you join me on this journey? I’m writing this for me, but in a bigger way it’s for you. The reason I would regret not writing about singleness while I was still single is because I want my life to be an encouraging example to anyone who is observing. I don’t have this figured out, but I do know there is so much to be found in the process. 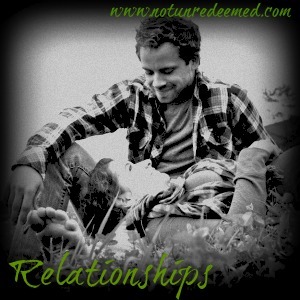 If you are single, I pray this is an encouragement to you and I welcome your feedback! Married friends, please consider sending this series to a single friend? And I invite you to stick around for the series as well. One thing I’m learning is that life is life, the applications are often different, but the truths are the same. Married or single, we both experience pain and joy. It may just look differently and I’d love to have you on this journey too. 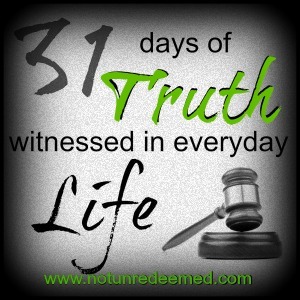 If you are new to Not Unredeemed or want to keep up with this series, please sign up to follow Not Unredeemed in the side bar. Many thanks to Natasha Metzler for the graphic design! (She is doing a 31 Days Series too. 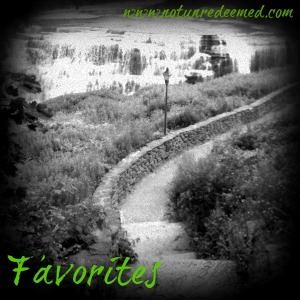 “Word Snacks – Bite Sized Devotionals for Your Hungry Moments.” Check her out! Thanks also to Dianne and Amelia for helping me brainstorm on just the write title to capture what I want this series to express. Community is wonderful peeps! 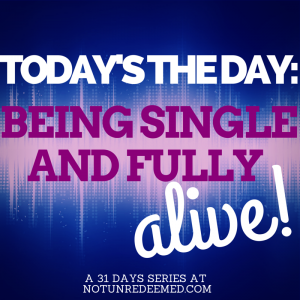 Categories: 31 Days - Today is the Day; Being Single and Fully Alive, series, singleness | Tags: Singleness | Permalink. I’m so excited about this series! I had no idea about the Nester’s challenge but I’ve been looking at it all day and I think I’ll try it too. Looking forward to seeing what you do with this! Thank you Bethany! Me too – only I don’t entirely know where it’s going! It’s a trust walk each day for the Lord to show me what to write on! How fun! Please send me your link! I’d love to read yours! !